Chris Hedges' picks for educating yourself about the state of America. When looking for guidance or inspiration for the resistance, Chris Hedges doesn’t put much faith in so-called leaders. 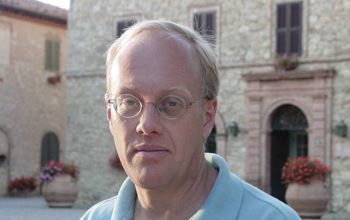 Chris Hedges was part of a team of reporters with the New York Times awarded a Pulitzer Prize in 2002 for coverage of global terrorism. That same year, he received the Amnesty International Global Award for Human Rights Journalism. “I look to people like Noam Chomsky and Antonio Gramsci, Rosa Luxemburg and Karl Marx. All of the theorists who understand how capitalism and imperialism works. You need that literacy,” he said. We asked Hedges for a short recommended-reading list – in addition to his new book, “America: The Farewell Tour,” a critique of the dire consequences of our nation’s unfettered capitalism. “Capital. Volume 1: The Process of Production of Capital” by Karl Marx. (1867) “There is no analysis of capitalism and how it works that’s been better,” Hedges said. “A Brief History of Neoliberalism” by David Harvey (2005) “If you want to understand the ideology of neoliberalism, read David Harvey’s book,” Hedges said. “A People’s History of the United States” by Howard Zinn (1980) A grassroots view of American history from laborers, women, people of color and others fighting for equal rights and justice. “Death of the Liberal Class” by Chris Hedges (2010). A primer on how the hallmarks of liberalism have collapsed and the extremes that filled the vacuum left behind. “Blowback: The Costs and Consequences of American Empire,” “The Sorrows of Empire: Militarism, Secrecy, and the End of the Republic” and “Nemesis: The Last Days of the American Republic” all by Chalmers Johnson. These three books are known as The Blowback Trilogy and address the illegal operations the U.S. conducts abroad and the world’s response.